Table decoration in spring – we like that colourful and vibrant. The colour scheme we chose was blue, green, yellow and white and we used it in all our decorative elements. 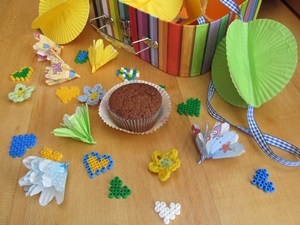 The main decoration material where muffin cases, once you have them in the colour you want you can make a garland with them, use them as paper flowers and bake the muffins which are served in them. The home made spring decoration consists of a pompom garland, paper flowers, small hama bead hearts and crochet flowers used as table confetti. Spring Party Decoration can be used for Mother's Day and Easter and for every other party between March and June (for Australians, South African and all other Southern people we mean of course November to February). As winters in the Alps are long, cold and white we love to see colour in spring, be it the first snow drops which are surrounded by brown mud than green meadow. The daffodils and lent lilies which greet us in vibrant yellow, fresh green from the growing grass and the developing leaves and hopefully blue sky. As nature is not always very relialbe, like with the long, greyish and cold winter 2013, where we had a very late spring, which hardly arrived and was again drowned in weeks of rain which culminated in devastating strong rains and floods, we prefer to stick to crafting material we have at home. 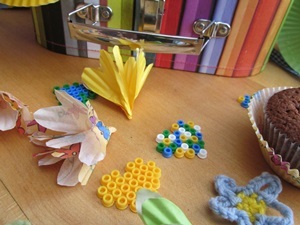 Single coloured muffin cases in yellow, green and light blue (from the muffin set Manuela), combined with flower covered muffin cases in yellow and light blue (muffin cases Elke) and the lightblue muffin liners with dots (lightblue muffin liners with snowflakes) made to pompoms – all together glued onto a white-blue gingham ribbon. You can use the garland as wall decoration or like we do use as centerpiece in and around the adorable cardboard suitcase Clarisse. 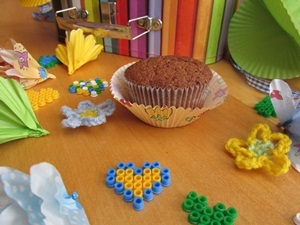 We used the same muffin cases designs for the paper flowers like we used for the garland. The paper flowers ensure to have flowers that won*t decay, however the temperature or the weather conditions. If it is a nice day add small vases with wild flowers and insert some paper flowers into the vases. We used a normal board for hama beads and placed small hearts following the cross stitch pattern for hearts and apple – some are single coloured, some two-coloured and some multi-coloured. To be quick at laying down the pattern I sorted the hama beads by colour and then we started. You can make a different coloured outer border to the big hearts. These hama bead hearts are great as tags like e.g. on an Easter branch. They are really quickly to lay out and to iron, I made several of them and have some stored for other occasions. Getting to muffins: for a spring celebration I would recommend something light and fruity like our delicious elderflower cordial cupcakes. As this posting was made 2013, an incredible season of heavy rains and floods through the Alps and as well the east of Austria and big parts of Germany, as well as Czech Republic, Slovakia, Hungary and Poland – we need something for the nerves and the soul and opted for spongy chocolate muffins.